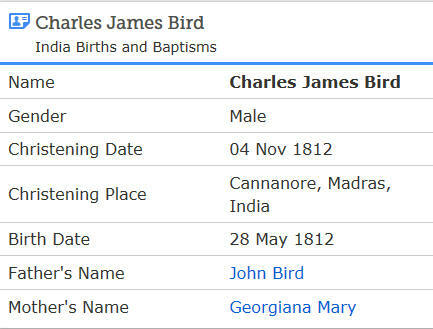 On my ggrandfather's birth certificate, his Father's name is given as James Bird. Although I cannot find a marriage, on the 1861 Census, an Alice Bird (nee Sands) is listed as living with her two young sons, one being my ggrandfather, Richard James Bird, at Hawkhurst, in Kent, UK. There is a note added against Alice that "she is supported by her husband who is employed on the Rail--INDIA". Similarly in the 1871 Census, James is not mentioned, and the words "husband absent" are added. By the 1881 Census Alice is stated to be a widow. 1952 T W Bird age 30 arrived Liverpool from Bombay on 2 Aug 1952 on board Jal Jawahar. (Ex births announcements from the Asiatic Journal and Register, 1837. Bengal Presidency. BIRD: June 1.At Mymunsing, Mrs J. Bird, of a son). A Lieutenant BIRD of the 12th N.I was a passenger to India on 2oth Sept 1837 as per Asiatic Journal on board a Ship named 'Marion' - Capt MacCARTHY; left Portsmouth for Cape & Bengal. Dorothea Caroline Bird (b 1833, d 1 May 1833 Bangalore). �I have upgraded the notes on our great grandfather Charles. As you remember he had three wives. I have now connected the dots on his first wife Mary Parrott (NB a Bird of a feather) and guess what he had three children with her before he met our GGM Sarah Kelton. Old rascal. (Ref. L/MIL/9/5/116 and L/MIL/9/43 and L/MIL/11/101)). Enlisted London and signed on for unlimited service on the 21/11/1839 Aged 23 (2nd European Light Infantry). He was aged 23 and was described as a stout person being 5' foot 5 and 1/4" inches with a fair complexion, brown hair, grey eyes and a round face. He was a painter by trade and was enlisted Captain Murray of London and by S. Granger and his enlistment was attested on the 22/11/1839 and approved 26/11/1839. Embarked on the "Reliance" on the 13/4/1839 and set sail for Madras, India. He was the Acting Corporal on board ship. He was said to be married with one child at the date of enlistment. He later re-married to Sarah Kelton (2nd marriage)on the 24/5/1843, aged 27. On the 27/11/1856 at the age of 40, he re-enlisted and served in the 2ND MADRAS FUESILIERS (now 108TH REGIMENT OF FOOT). He achieved the rank of Sergeant in 1860 at the age of 44. On the records of the "Madras unattached list for 1864" (ref. L/MIL/11/187). Charles James was then a 48 year old private. He was discharged and pensioned in 12/1863 and overall he had 21 years of military service which included the "INDIAN MUTINY of 1857-1858". Effective Super October 1861. The annual register of European Pensioners in 1865 (ref. L/MIL/11/188) has a mention of him, in which his age is given as 49. Charles James Bird was born in 1816. He was first married at the age of 20 to Mary Parrott on the 30 May 1836 in Islington, London, England. They had three children during their marriage being Charles, Emma and George. There are no records of their divorce but Mary died at the age of 76 in 1889 in Paddington, London, England. He was then re-married to Sarah Kelton 24/5/1843 (Second marriage) at the age of 27 and he was then a corporal in the 2nd European Light Infantry. She was then aged 18 and they had two sons Charles and George. The witnesses at the wedding were Wiliam Nolan and Charles Bird. Sarah Bird died of Cholera on 8/12/1858 aged 33 years and was buried by the Minister Ward Mant of Coonoor and Jackatta Goolinge on the 9/12/1858. Charles then married again to Agnes Clegg on the 5/10/1864 (Third marriage). Agnes was just 16 years old and Charles was noted on the marriage certificate to be 45 years old but was in fact aged 48. Having learnt masonry work in England, before his enlistment in the British Army, he obtained an appointment as the Superintendent of the Madras Mint and was a resident of Blacktown. Between 1860 and 1864 he worked for 4 years as the "Temporary assistant overseer" in the Department of Public Works. At the birth of his third son Anthony and daughter Mildred with Agnes Clegg, Charles James Bird was living in Mysore and was a boiler chargeman. (Ref. N2/134/148). After that he worked as a Jailor in the Mysore Central Jail for seven years being awarded a gratuity when his services where dispensed with on account of advanced age (65 years old). From Mysore he returned to Bangalore and was a resident for a further 18 years. He died (Ref. N2/86/21) Aged 83 on the 26/7/1899 leaving a widow, one son and one daughter from his third marriage and several grand and great children. He was buried the next day at St John's, Protestant Cemetry in Kulpully, Banglore and the cause of death was noted as debility. He was described on the death certificate as a pensioner and the service was conducted by the Reverend Clement H.L. Wright, M.A. Chaplain of St John's Church. There was no will for Charles James Bird. Robin Edgar BIRD (7/11/1929 - 5/2/1988 Bitragunta). Bird Family at Guntakal (Railway Colony). Photo taken on the handing over of the Railway Superintendent position held by Robert Charles BIRD, seen seated in the middle alongside his wife Violet and their children. Colette Mary FONCECA (b 5th May). Sybil BIRD (daughter of ? BIRD) (d Perth) married William Edward REAY (d Oct 2002 Perth) . William spent his last few years alone, and died of heart failure on 16/10/2002, aged 74, in the Joondalup Health Campus where his brothers Carlton and David visited him. The contributory cause was pneumonia. His final resting place is in the garden of remembrance in the Karrakatta cemetery in Western Australia. No Children. Lionel BIRD (son of ? BIRD) married Pearl GOMES. They live at 73 Vellelore Rd, Podanur 641023, South India, and are doing some marvellous work for the underprivileged children there. Annamarie Charmine Mathews (Perth) married to Kerwin Joseph Mathews. Children :Jordan Kane Mathews & Damian Chad Mathews. George BIRD (Chicken) (UK) married Mavis ??. Children in the UK. Yvonne Heather Bird (Philo) (25May) married Bernard CHATELIER (India). No children. Michelle Howell married Ian Nisser. Children : Jessica Nisser & Kevin Nisser. Jennifer BIRD (son of Leslie Bird) married Michael ADIE. Laura BIRD (daughter of Leslie Bird) married Garnet HODGES. Shirley Edna Violet BIRD married Douglas Joseph VIEGAS (of 103 Church St, Camp Belgaum), at St.Anthony's Church, Coonoor on Wednesday 6th Jan 1971 , 4pm. Adrian Percival Clement BIRD (b1947) married (3rd marriage) Georgina Edna NOTLEY (nee Ford). No children. Lyndon BIRD (son of Eugene Bird who lives in Bangalore) married Nicolette SUARES. They now live in Canada. An Educational Game Developing Numeracy Skills.